Celebrity DUI Category Archives — Massachusetts DUI Lawyer Blog Published by Boston, Massachusetts Criminal & DUI/OUI Defense Attorney — Stephen Neyman, P.C. Back in August, I wrote about the arrest of former Big Dig chief Matthew Amorello for operating under the influence of alcohol. Amorello is a former chief of the Massachusetts Turnpike Authority, but best known for resigning his post after part of the Ted Williams Tunnel collapsed during the Big Dig, killing a woman. He reentered the news this summer when he was arrested for operating under the influence and leaving the scene of an accident. According to reports, Amorello crashed his SUV into two parked cars in Haverhill, then drove away even though he’d lost one wheel. Authorities found his Ford Explorer parked at a Mercedes dealership with him unconscious inside. Reports in following days noted that he missed a court date because he was hospitalized. The Boston Globe reported Nov. 30 that Amorello has arranged a kind of plea deal with the Haverhill District Court. Amorello admitted to sufficient facts to prove the OUI and leaving the scene charges, which is not quite the same as a guilty plea. Rather, it means he admits that a jury would have the facts necessary to convict him if his case went to trial. The judge in the case continued his case without a finding for a year. If Amorello can stay out of trouble for that year, the case will be dismissed. I’d like to discuss Amorello’s sufficient facts plea, because it’s part of my set of tools as a Massachusetts drunk driving criminal defense lawyer. Admitting sufficient facts is a lot like a guilty plea, but it could be slightly better for someone in a public service position like Amorello used to hold. A plea of sufficient facts shows up on your Massachusetts driving record just like a conviction would. However, it does not show up on a background check by any agency other than a law enforcement agency. This would allow Amorello to plead guilty and serve the sorts of penalties that a guilty plea creates, but maintain his ability to truthfully answer “no” when asked if he was ever convicted of a crime. The incident will not show up when potential employers, landlords and other non-police organizations check for a criminal background. Often, people who admit to sufficient facts are first OUI offenders who end up sentenced to alternative disposition. As a Massachusetts OUI criminal defense attorney, I prefer this for all of my clients who are not fighting the charges, because the penalties are better for the client. Alternative disposition calls for up to two years of probation, not jail; loss of your driver’s license for 45 days, not 90 days to a year; and lower fines. That isn’t to say that alternative disposition is a light penalty or fun for the driver. For one thing, any mistake that violates probation could cancel the deal and force a guilty plea. But for drivers whose best strategy is a guilty plea, admitting sufficient facts and serving probation successfully can help them admit their mistakes and pay the penalties without allowing those mistakes to haunt them for the rest of their lives. Prospective employers, dates, coworkers and friends can find information about most of us online. Unfortunately, that can include news reports about our misdeeds and mistakes. A number of candidates who ran for office this year have learned this the hard way, from Delaware Senate candidate Christine O’Donnell’s claims to have been involved with witchcraft to Massachusetts Republican Jon Golnik’s OUI arrest in 2001. As a Massachusetts OUI defense lawyer, I think it’s important for everyone to realize that any admissions they make if they ever face a drunk driving charge can follow them for a long time. That’s why it’s important to know your rights, including what you are and are not required to say or do when you interact with the police. Jon Golnik was arrested for OUI drugs and alcohol in 2001, and he continued to have to answer questions about it nearly a decade later, since he ran for the Massachusetts Fifth Congressional District seat in the U.S. House of Representatives. Golnik, now 45, had attended an AC/DC concert at the FleetCenter in Boston, and police found him shirtless and slurring his speech. The police report from this incident says Golnik told the police he had four beers, and admitted that this impeded his ability to drive safely. He was also driving on a flat tire. He has denied smoking marijuana, which he was charged with, but he admitted to having drunk alcohol before driving. While the marijuana charge was dismissed, his license was suspended. As I’ve written here before, if the police pull you over on suspicion of drunk driving, they already think you’re guilty. 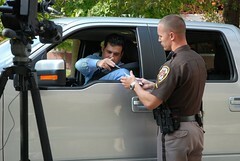 During the traffic stop, they are looking for evidence to include in the police report, which can be used against you at trial. That’s why it’s important to politely refuse to answer police officers’ questions about whether you have been drinking — and never, ever volunteer that kind of information. Instead, consider saying that you need to speak to your attorney, and then actually speak to an attorney as soon as you can. If you can keep incriminating statements like the one Golnik made out of the police report and out of public record, your attorney stands a much better chance of helping you get the charges dismissed or a not-guilty verdict. As a Massachusetts drunk driving defense attorney, I can tell you that avoiding an OUI conviction is important for a lot of reasons. Obviously, you don’t have to worry about jail time or the steep fines and fees that go with a conviction, but you also don’t have to worry about your auto insurance rates skyrocketing or having to disclose a conviction on job applications. Unfortunately, since most police reports are public records, information about an OUI arrest could still become public even if the charges are dismissed or if you’re found not guilty. But if you have avoided incriminating yourself by admitting to drinking and driving, you can much more persuasively explain your drunk driving arrest to anyone who asks as a simple mistake by the police. Those of us who followed the progress of the Big Dig remember well the name Matthew Amorello, the former chair of the Massachusetts Turnpike Authority who oversaw the massive construction project for four years. Amorello resigned from that post after a woman was killed when part of the roof of the Ted Williams Tunnel collapsed on her car. Now, Amorello faces charges for OUI and leaving the scene of an accident with property damage. Many Massachusetts residents don’t think fondly of Amorello, since he’s been associated in the public mind with the sky-high cost overruns, scandal, and tragedy of the Big Dig. But as a Massachusetts drunk driving defense attorney, I think it’s important to point out that like anyone else facing charges, Amorello is innocent until proven guilty, and he’s entitled to defend himself against the charges just like anyone else. Amorello, 52, of Wenham, was arrested after allegedly hitting a 1999 Saab and a 2005 Dodge Magnum with his 1999 Ford Explorer. Haverhill police found Amorello in his Explorer, minus one wheel, in the parking lot of a Mercedes dealership. A Haverhill police officer said, “He was really out of it, and he didn’t know where he was.” Additional details about the arrest, like how the police determined that Amorello was intoxicated, were not available. Leanor Santos saw Amorello’s car hit hers. “All you could see was flames from the car as he was driving away,” she said. Amorello posted $40 bail and was scheduled to be arraigned at Haverhill District Court on August 9. However, he missed the court date because he was hospitalized at UMass Memorial Medical Center, his attorney told the judge. The article did not say why Amorello was hospitalized, but the attorney noted that Amorello was apparently unconscious when arrested. It’s always a challenge for people charged with OUI to ensure that their rights are respected as they go through the legal process. It can be even more challenging for public figures who are associated with controversial issues unrelated to their OUI charges. As the Boston Herald reported, not only was Amorello in charge of the Mass Turnpike Authority during the fatal tunnel collapse, but prior to his resignation, he changed his department’s policy on sick leave so that when he left, he could receive $75,000 as compensation for his accrued but unused sick time. For that, he was fined $2,000 by the state ethics department. There’s no question that this raises serious ethical questions, but it’s important for the law to deal with Amorello’s alleged drunk driving and leaving the scene charges on their own, not in the context of unrelated accusations against him. In my experience as a Massachusetts OUI criminal defense lawyer, people in Amorello’s position fare best when they work with a well-trained attorney who can ensure that their public image is kept separate from the charges that they actually face. 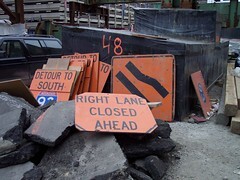 There has already been some particularly nasty commentary about Amorello in the press, and his family has said that public criticism stemming from the Big Dig controversies has led to his personal struggles. Under these circumstances, it would not be a surprise if Amorello is feeling even more upset and unsettled than another person charged with OUI would be. That’s exactly why it’s best to hire a Massachusetts intoxicated driving defense attorney who can handle the case carefully. This can mean making sure that the arresting officer followed the law to the letter, that all the defendant’s rights are preserved, and that the outcome of the defense is as favorable as possible — either a dismissal of charges or a not guilty verdict. A Boston College Eagles player was arrested in New York for drunk driving and driving without a license. The Staten Island Advance reported Jan. 13 that Dominick LeGrande, 20, was arrested early on the morning of Jan. 10. LeGrande, a sophomore linebacker with the Eagles, was spotted by police at a bar in Stapleton, NY that police suspect serves underage patrons. After he got into his mother’s vehicle and drove away, police followed him and stopped him for a defective headlight. At the scene, officers noticed signs of intoxication from LeGrande. He admitted that he had been drinking, and a breath test showed a BAC of 0.164, just over twice the .08 legal limit. He was arraigned in the local criminal court for driving under the influence of alcohol and driving without a license, and released without bail until his April 1 court date. Neither BC nor LeGrande would comment. Because the incident took place in New York rather than Massachusetts, LeGrande will be tried under the laws of that state. But if a Massachusetts OUI criminal defense lawyer were handling a case like this, I believe he or she could mount a good defense. First, I would like to take a closer look at the legality of the original traffic stop. The article said police were staking out the bar where LeGrande was drinking because they suspect it serves minors. It also mentioned that LeGrande was driving his mother’s 2002-model vehicle. This suggests that the defective headlight that formed the basis of the traffic stop may have been an excuse rather than a serious concern. If the court finds the stop illegal, all of the evidence generated by that stop, including the breath test and LeGrande’s own statements, would have to be thrown out. Even if this is not feasible, or the client prefers to plead guilty, that doesn’t mean he’d be harshly punished. In fact, I believe an experienced Massachusetts drunk driving criminal defense attorney could make a good case for the 24D program, were this a Massachusetts DUI case. LeGrande has no reported previous offenses, and there was no accident or injury in the case — not even property damage. Because of his status as a fairly high-profile athlete, he is likely to face a suspension for at least a game or two, regardless of what the courts do. He is also likely to be attacked in the press, making it tempting for authorities to “make an example” of him. However, too many criminal penalties could end his athletic career, even though a first drunk driving conviction is unfortunately a common mistake among college students. That makes it essential to avoid a first DUI conviction now, possibly by entering the 24D/alternative disposition program or pleading guilty to a lesser charge like reckless driving, if that state permits such a resolution. State Senator Anthony Galluccio is headed to jail, the Boston Herald reported Jan. 4. Galluccio, a Democrat elected to represent Cambridge will serve a year in jail in connection with an Oct. 4 hit-and-run accident he admits to causing. That crash caused only minor injuries to a father and teenaged son, but Galluccio left the scene. He did not turn himself in until the next day, making it impossible to test him for alcohol, but he has two past OUIs (one pardoned) and a past accident. When Galluccio was sentenced for the hit-and-run, Judge Matthew Nestor gave him six months of home confinement with exceptions for Senate votes and church, on the condition that he not drink and submit to random alcohol testing. His driver’s license was also revoked for five years. That sentence was handed down Dec. 18. On Dec. 21, a probation department employee came to install an alcohol-testing device called a Sobrietor in Galluccio’s home. Right after installation, the device detected alcohol on Galluccio’s breath. The senator said he hadn’t had any alcohol and suggested that sorbitol, an artificial sweeter in toothpaste, may have been the culprit. Despite testimony from an expert witness, Nestor said he believed Galluccio had been drinking. He revoked Galluccio’s probation and sent him to jail for a year. Senate President Therese Murray issued a statement suggesting that Galluccio will lose his job if he does not resign. Galluccio’s suggestion that toothpaste may have set off the Sobrietor is attracting ridicule in some circles. The Boston Herald even went so far as to test the theory, using a home breathalyzer kit. But Massachusetts OUI criminal defense lawyers already know that toothpaste, mouthwash and other alcohol-containing substances can give a false positive on a breathalyzer test, even though the person may in fact be sober. As the Herald’s test shows, taking a reading directly after brushing your teeth, sipping a beer, belching or more can produce high readings, which fall off dramatically in a few minutes. This is because of residual alcohol in the mouth. Breathalyzers are supposed to work by testing the alcohol in the air expelled from the person’s lungs, then using an equation to calculate BAC. Using the same equation for the much higher amount of mouth alcohol can produce a very high but temporary reading. This is why law enforcement officers are supposed to observe the driver for 15 minutes before administering a breathalyzer — to ensure that enough time has passed since the last drink to avoid a false positive. Failure to do this, or to follow several other procedures, can make the evidence tainted or suspect. When this is the case, an experienced Massachusetts drunk driving defense attorney will ask the judge to leave that evidence out of the case entirely. In effect, this substantially weakens the prosecution’s case, because without a BAC reading, it is much more difficult to prove that the defendant operated a motor vehicle while intoxicated. Did you know that actor Jeffrey Donovan is from Amesbury, Massachusetts? Well his is and just recently he was arrested and charged with OUI in Miami. Apparently Donovan almost hit a police car. To avoid doing so he swerved and screeched his tires. Donovan admitted to “not seeing the red light”. Nor for that matter did he see the police car. Donovan failed the field sobriety tests but admitted to having only three glasses of wine, and of course some Benadryl. He admitted to being “borderline drunk”. Here is the problem with admitting to being “borderline drunk” in Massachusetts. Drunk Driving Laws in Massachusetts do not require the suspect to be drunk to get convicted. The legal standard operates on the phrase “under the influence”. The model jury instruction in Massachusetts states that you do not have to be drunk to be under the influence of alcohol. Rather, a person is under the influence of alcohol if he has consumed enough alcohol to reduce his ability to operate a motor vehicle safely. That determination is for the jury to make. So, three glasses of wine and erratic operation are not necessarily indicative of operating under the influence. The other factors such as failed field sobriety tests and smelling of alcohol help the prosecution. However, most damaging is Donovan’s admission that he was borderline drunk. Former NFL defensive lineman Bruce Smith was convicted of DUI and the charge of refusing to take a breathalyzer test by a Virginia Beach judge. As a result Smith was given a ninety day suspended sentence. He will also lose his license for twelve months. During the trial Smith claimed that he had difficulty taking and adequately performing the field sobriety tests due to a list of injuries he suffered during his NFL career. The judge believed that Smith’s level of intoxication prevented him from following the police officer’s instructions on how to take the field sobriety tests. The arresting officer testified that Smith was speeding and that when he pulled him over he smelled a strong odor of alcohol on his breath. Smith’s eyes were bloodshot and glassy. There is an interesting twist to this case. The officer who arrested Smith was subsequently arrested and charged with DUI as well. The officer crashed his car and failed three out of four field sobriety tests that were administered. Evidence of the pending DUI charges was not admissible against the officer. Here is a question. Why was the fact that the arresting officer had a pending DUI charge inadmissible at Smith’s trial? The prosecutor claimed that the crime of DUI does not affect a witness’ credibility. While that might be true in most cases it should not be in this DUI case. We know that the arresting officer failed three out of four of his field sobriety tests on his case. That officer has pleaded not guilty, thus maintaining his innocence. Suppose the officer believes that he adequately performed his field sobriety tests notwithstanding a subjective opinion to the contrary. If that is the case then it seems to me that a judge should have allowed questioning of the officer on this issue. This would enable Smith to show that when this officer behaved in the same manner the officer believed that he was not impaired. Consequently, Smith could argue that similar behavior manifested on his part does not amount to a credible opinion that he was impaired. In other words, the arresting officer’s opinion that he passed the field sobriety tests and Smith failed is a matter of credibility that Smith should have been able to make known to a jury. Owen Schmitt is slated to be the Seattle Seahawks starting fullback this season. He is a fifth round draft pick from West Virginia going into his second season in the National Football League. Last weekend Schmitt was arrested and charged with drunk driving or OUI as it is called in Massachusetts. Officers observed Schmitt’s vehicle weaving and following other cars too closely. He was pulled over at which time the police noted the smell of alcohol. Schmitt submitted to performing field sobriety tests. He failed those tests and took the breathalyzer test. The results exceeded a .08. The consequences of a first offense OUI in Washington are much more severe than in Massachusetts. There is a mandatory sentence of at least one day for a conviction of this crime. There is no mandatory minimum period of incarceration in Massachusetts for the same offense. Washington has a mandatory ninety day loss of license. Massachusetts’ is half that long. You must install an ignition interlock device after a first offense conviction in Washington. This is not the case in Massachusetts. One aspect of Washington law that is more favorable than in Massachusetts is the look back provision for prior offenses. Washington has a seven year look back whereas Massachusetts considers any prior conviction in calculating what offense is being charged.